I created this recipe about 35 years ago. I adapted it from an old “Hippie” cookbook I found while with one of my husbands when living in Fort Collins, Colorado. It was so cold there I had to come up with something to keep us warm! 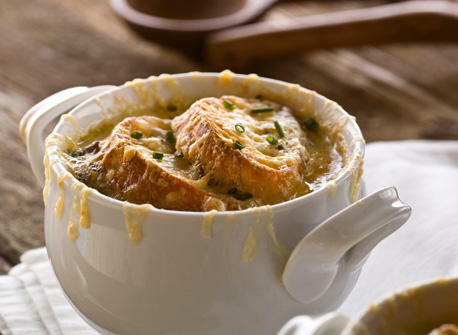 This is one of the best French onion soup recipes I have ever tasted! NOTE: If your beef stock lacks depth, add a Tablespoon or so of a good quality beef concentrate or demi-glace. You need a rich, beefy taste here. *Remember, if you wouldn’t drink it, don’t cook with it! *Dry toasted bread works well for this recipe. This can be done in the oven by baking for 10 minutes in a 400 degree oven or in a toaster oven. Sauté onions in butter and olive oil until limp, golden and buttery, about 20 minutes. The olive oil helps keep the butter from browning too quickly. Stir as needed to keep an even color on the onions. Mix in beef broth, demi-glace or beef concentrate if using, wine, sherry and garlic. Heat through. Taste for seasoning and adjust to your personal taste. You may find you like a little more wine or sherry, or that the broth needs a little more beefy taste. Ladle the soup into 4 ovenproof bowls, distributing the onions as evenly as possible. Don’t overfill the bowls – there’s more to add. Sprinkle a little of the Romano or Parmesan cheese directly over the soup. Now top each soup serving with slices of toasted bread (cover the soup). Sprinkle your choice of cheeses evenly over the top of each soup and add a little more Romano or Parmesan (just a little). Put soup bowls onto a cookie sheet (it might boil over). Bake in a 400 degree oven for about 35 to 40 minutes or until the entire top is puffy and golden. When you are ready to eat, use the back of your spoon to push down the topping into the soup. Be careful! It will be hot, but Oh! So good! !